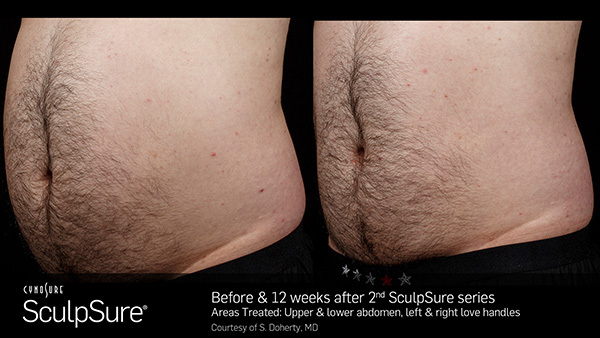 SculpSure™ is a revolutionary method of eliminating excess body fat and contouring the body to create a sleeker, leaner, and more aesthetic appearance. Weight loss and fat reduction are always hot topics with men and women, and there are countless companies, clinics, and products that claim to be effective at helping people reduce their waistlines and get the bodies they’ve always wanted. However, many of those products are either outright ineffective or come with a host of side effects and potential complications. SculpSure™ is different. It’s the world’s first laser treatment that’s designed to target fat cells throughout the body. Not only has it been officially cleared by the U.S. Food and Drug Administration to be used for this purpose, but it’s also completely non-invasive. Treatments are quick, painless, and come with zero downtime. In fact, they’re so fast and gentle that you can have a treatment performed on your lunch break and be back to work the same day. Liposuction is a surgical procedure that uses a small suction tube to physically remove fat deposits from patients’ bodies. There are several significant drawbacks associated with liposuction. It’s, an invasive procedure. Patients must be anesthetized, as the procedure can’t be performed without the use of an incision made with a scalpel. That means patients will experience significant downtime due to the prolonged recovery period. In addition, results can be inconsistent, leading to an uneven appearance. Finally, patients may also be at risk of infection, blood clots, and changes in sensation due to nerve damage. Like SculpSure™, CoolSculpting works by changing the temperature of fat cells. However, while SculpSure™ eliminates fat cells by heating them until they become structurally unstable, CoolSculpting “freezes” them until they die and are eliminated by the body. Although CoolSculpting is similar to SculpSure™, it has a few prominent drawbacks. First, it’s a 60-minute procedure compared to a 25-minute procedure. Second, the procedure itself is known for being relatively uncomfortable, and patients must be massaged in treated areas before they leave the clinic. Finally, CoolSculpting generates results slower than SculpSure™. 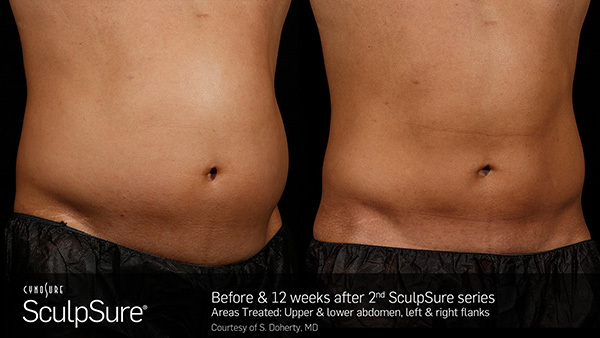 While SculpSure™ produces noticeable results within six weeks and optimal results within three months, CoolSculpting can take up to two to three months for results to begin to appear.